This FENDI Men's Polo Shirt, is evident in the substantial cotton-jersey which will feel better with every wash and wear. With subtle contrast detailing on the collar and sleeve, this Polo Shirt will be sure to add a touch of style to off-duty ensembles. We have a limited edition out for each collection, so take advantage of this opportunity to get into their possession. 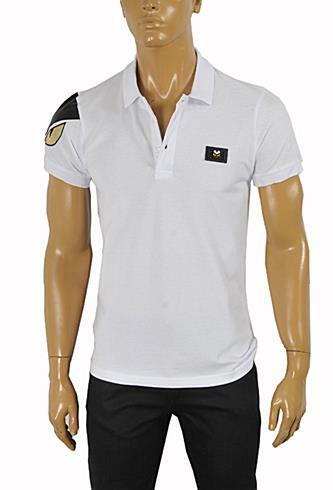 This FENDI Men's Polo Shirt is made In Italy of 100% cotton in white color. Shoulders (from seam to seam) 16½" 17" 17" 18" 18½"
Width (from one armpit to the other) 19½" 20" 20½" 21" 21½"
Length (from neck seam to the bottom) 27½" 28" 28" 29" 29½"
Sleeve 8" 8" 8" 8" 8½"